Thanks to George Harrison, the G6122 Country Gentleman is the most iconic double-cutaway Gretsch, and here it’s recreated in true vintage style by Master Builder Stephen Stern and his Custom Shop team. Stephen Stern’s Gretsch Custom Shop creations have been dazzling guitar players for years now, so much so that even the act of opening the case of his latest vintage love letter is an event in itself. The case is a gorgeous repro of a 60s example, which feels a fair bit heavier than an original, but the lid opens to reveal plush burgundy velvet with the iconic Gretsch banner, and of course, the imposing presence of a guitar that somehow appears neither ancient, nor entirely new. What the thinline G6122’s body lacks in depth it makes up for in width, measuring a full 17 inches across the lower bout. The ruddy brown Walnut Stain has the muted but deep vintage lustre that so few artificial agers seem to get right; great restraint is shown with the dents and scratches, but lacquer checking can be seen all over the body and headstock. Interestingly, Gretsch has elected to avoid checking on the back of the neck and the finish here hasn’t been dulled either. The checking stops at the outer edges of the back pad, beneath which the finish looks shinier. Again this is the sort of detail that lifts relicing from the artificial to the artful. The checking on the front looks a touch ‘aerosol induced’, but the way it follows the grain lines on the back is a lot closer to the real deal. 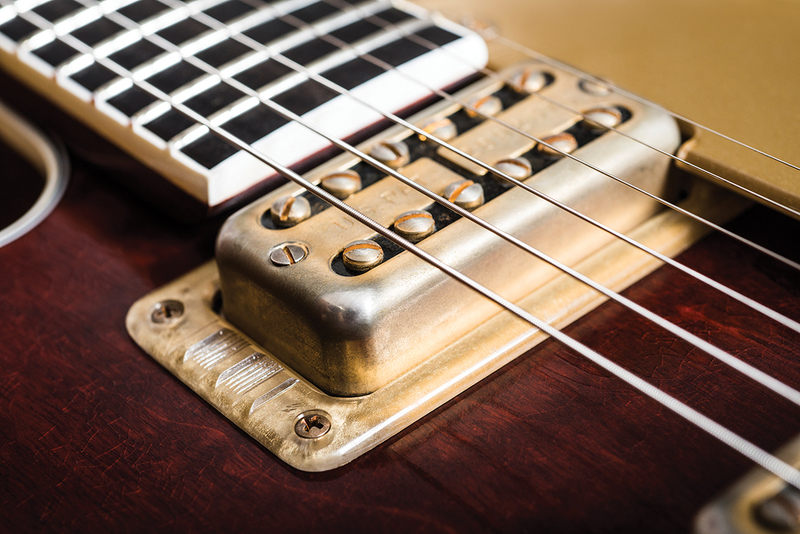 No doubt a guitar like this with fresh gold hardware would be an assault on the senses – it must have felt as opulent as a Trump Tower toilet back in the day. 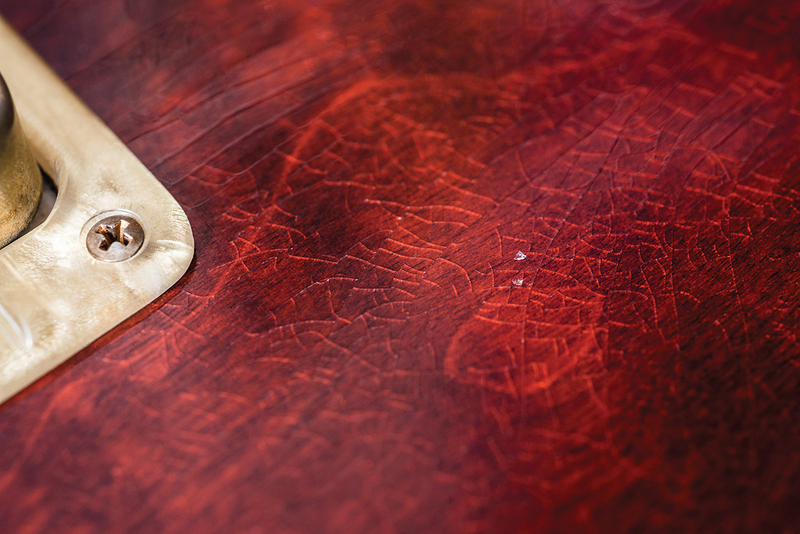 On this guitar, however, the plating has been given a sense of play wear patina that is about 70 per cent nickel and only 30 per cent gold. The mechanisms for the mutes look alarming, but are solidly made contraptions, with levers mounted on glued wooden bases and L-bracket pivots screwed into the braces. The braces themselves have been altered to provide clearance for the levers and it looks like they were roughly chiselled out. This is probably the way Gretsch would have done it back in the day, and that’s the sort of detail we can appreciate. From the fret nibs to the colour of the marker dots and even the shade of tinted lacquer sprayed over the binding, we can’t fault the build quality. Even if most of the original double-cut Gretsch Country Gents were not quite so flawless, this G6122 doesn’t feel overly perfect or lacking in character but rather has the aura of a Gretsch that has been ‘done right’. 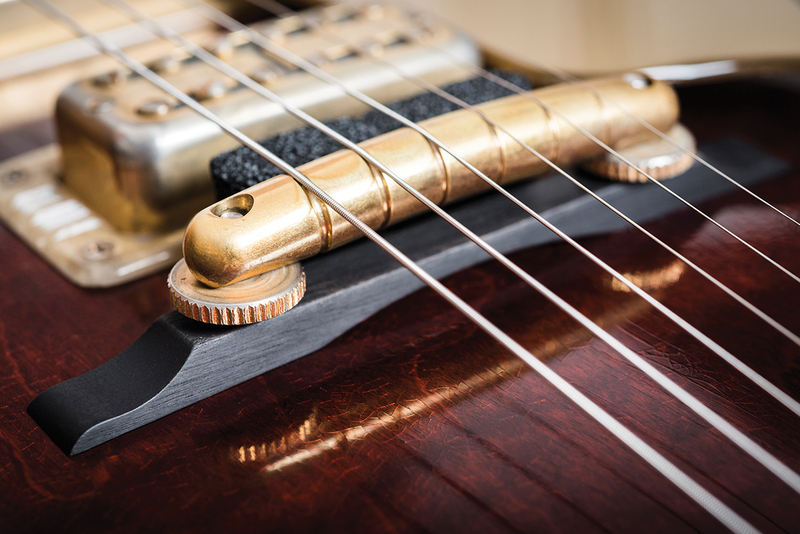 Despite its lack of a centre block or trestle bracing, the G6122 is a portly gent, but the body weight offsets the heavy tuners and it balances well. The neck is a decent handful with a fat C verging on U profile. It reminds us of the 1960 Anniversary featured in a recent Vintage Bench Test – there is a bit of a shoulder under the fingerboard binding, but the overall feel is both comfortable and familiar. Closed f-holes make a massive difference to acoustic tone. It sounds lot closer to our closed-f-hole ’63 Tennessean than our open f-hole 1960 Anniversary. It’s a fatter and smoother sound with massive depth but a rolled off treble response. Having said that, the G6122 has a richer tone than our Tennessean, and much longer sustain. It’s louder, too, and the tone retains smoothness and evenness up the neck until the 17th fret. Above that things get a little uneven and sustain is lost, but that happens with jazz-style fingerboard extensions beyond the neck tenon. 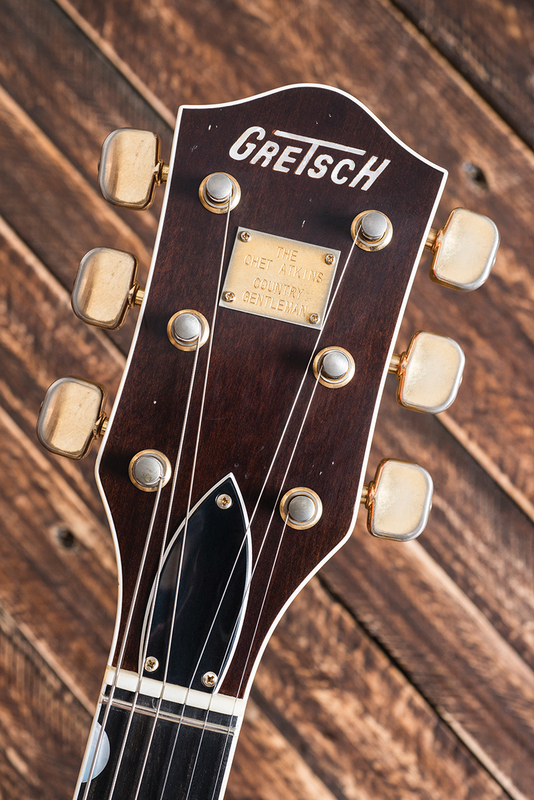 Vintage Gretsches are notorious for buzzes, rattles and unwanted noises. This G6122 only has one such issue and it’s frequency-related: play an A note on the top E string at the 17th fret or the B string at the 22nd fret and a buzz sets in. It’s certainly mechanically-induced and no doubt it can be remedied. But we’re really splitting hairs here – this guitar is an absolute joy to play unplugged. Much of this ‘good behaviour’ can be attributed to the Tru-Arc bar bridge. 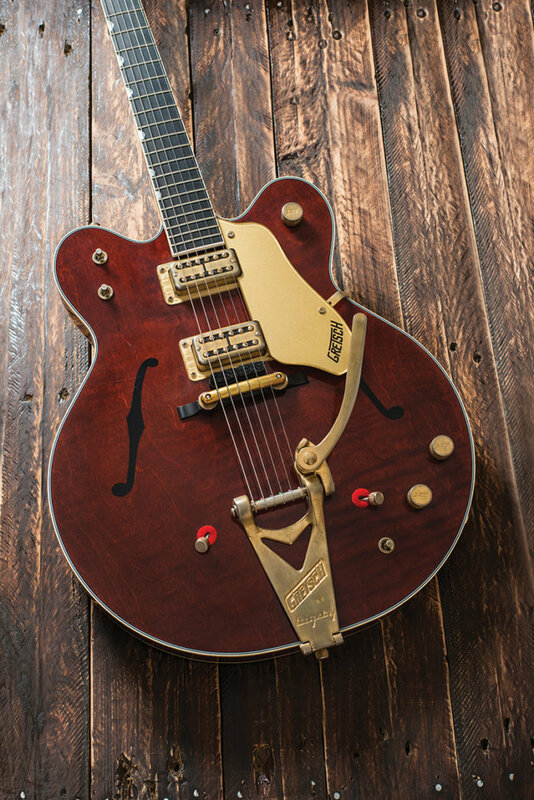 Gretsch buys in premium parts for its top of the line models, pre-empting the upgrade impulse. These bridges, along with the TV Jones Classic Filter’Tron pickups, are a case in point. 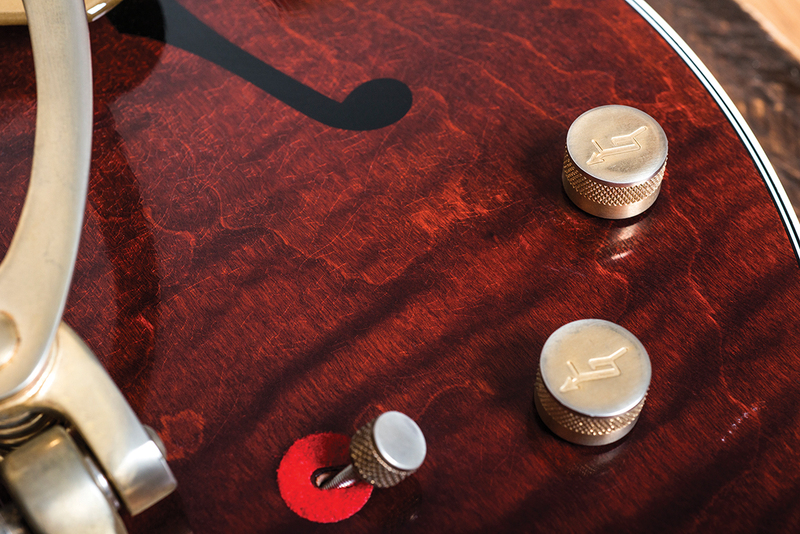 The bridge radius is matched to the ’board, which ensures better-than-vintage playability and helps with intonation. TV Classics can sound aggressive in some guitars, but they are utterly fantastic in this one. Having said that, Filter’Trons are finickity things and the Custom Shop has done well to set the pickup heights and line up all the polepieces perfectly for balance and string-to-string definition. Plugged in, this G6122 is endlessly fascinating because it’s so full of contradictions. It’s full-bodied and twangy, low-ish in output yet growly and snarly, clear and pure but harmonically rich and sometimes gritty. Although the bridge pickup has some quack, it’s nothing like the blackguard/jazzbox hybrid tone you might associate with Brian Setzer. This G6122 is woodier, smoother and more refined-sounding than a 6120. It’s also easier to play because it’s less prone to feedback. It evokes an era of electric guitar music that came before obsessions with volume, distortion and sustain. Everyone who tried it in the GM office seemed compelled to delve into their mid-period Beatles repertoires, dredge up half forgotten Kinks tunes or crank it up for some CSNY and AC/DC. Relatively few of us will know how a brand new Country Gent would have felt in the 1960s. But if they were anything like this guitar, it’s no wonder that so many of the great players used them because it’s a seriously high-end experience. Without sacrificing the quirkiness and oddball charm that is so quintessentially Gretsch, this Custom Shop G6122 is a luxury ride by any standards and, age notwithstanding, it is among the finest sounding and playing Gretsch guitars that we have ever encountered.